This cabin was built from the same plans as Cabin A. 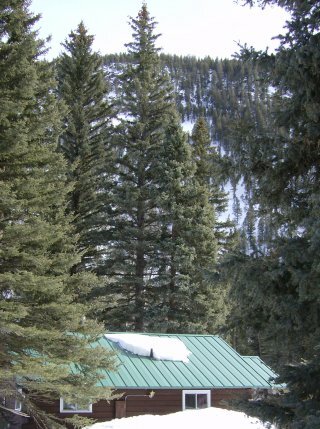 It also has views of the river and the forest. It has a front porch and also has a propane grill. With two bedrooms with a queen bed in each and two futons in the living room it can sleep 6. 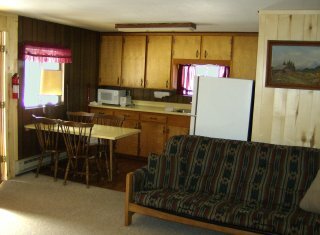 It has a complete bath (tub and shower) and a complete kitchen with dining table and equipment. 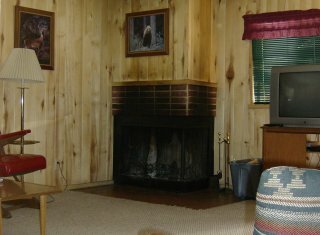 It has a small wood fireplace in the corner of the living room. There is a satellite TV/VHS/DVD.